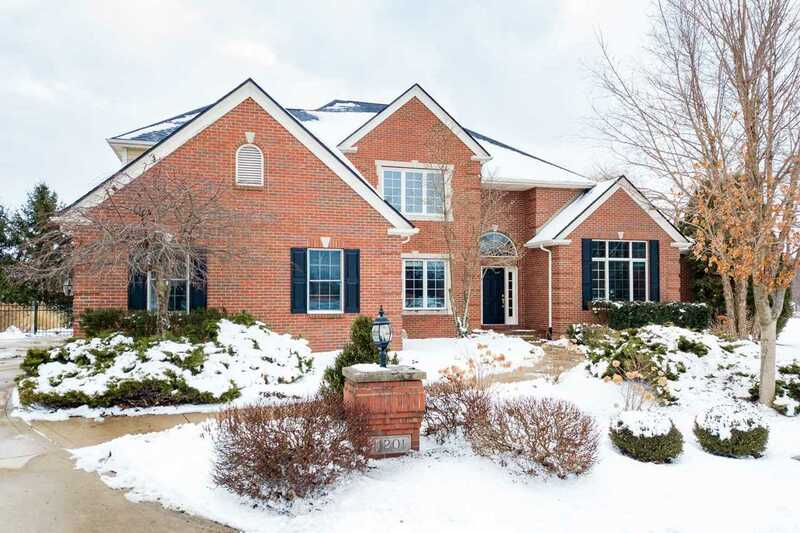 At the end of a cul-de-sac in the Chestnut Hills neighborhood is a beautifully updated brick Masterpiece built home that offers the perfect setting for all-season fun. Walking through the home you'll find timeless charm, updated features, and an abundance of natural light. Just off the foyer, the office den has built-in Harlan cabinets with granite counter top, wine rack, and refrigerator. The great room features three circle-head windows and a two-way fireplace with granite and wood surround with a gas starter. In the gourmet kitchen, you will find Dutch Maid cherry-stained cabinets with granite countertops, a Viking stainless steel range, stainless refrigerator, and dishwasher. The master is on the main level with its own luxury ensuite bath with jetted tub, tiled walk-in shower, double vanities, and his-and-her closets. There are three large bedrooms on the upper level, each with its own full bath. The daylight lower level has a family room, rec room, exercise room, and a full bath. Some of the updates include fresh paint throughout, brand new roof, new mitigation system, all new windows on the lower level, new light fixtures, fresh landscaping, and updated security system. Directions:State Road 14, RIGHT onto Chestnut Hills Parkway, RIGHT onto Chestnut Ridge Drive, LEFT onto Monte Vista, RIGHT on Bay Pines Court. The home is at the end of the court. SchoolsClick map icons below to view information for schools near 11201 Bay Pines Court Fort Wayne, IN 46814. Listing provided courtesy of Lynn Reecer, Encore Sotheby's International Realty.